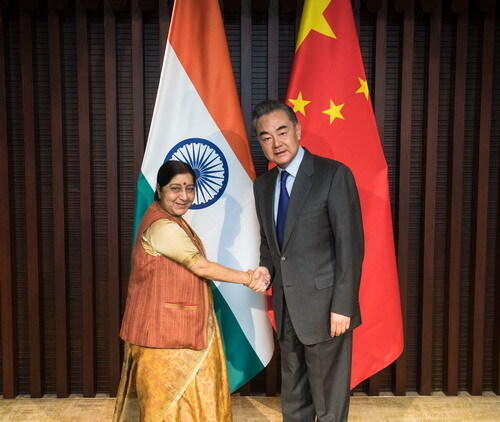 On February 27, 2019, State Councilor and Foreign Minister Wang Yi met in Wuzhen of Zhejiang Province with External Affairs Minister Sushma Swaraj of India, who was in China for the meeting of the Foreign Ministers of China, Russia and India. Wang Yi expressed that the Chinese side has always placed China-India relations at an important position in its neighboring diplomacy. Last year, President Xi Jinping and Prime Minister Narendra Modi successfully held an informal meeting in Wuhan, leading China-India relations into a new stage of mature and stable development. The cooperation between the two countries in various fields has been carried out smoothly, and the expectations of all sectors of society and the international community on China-India relations have become more active. In the new year, the two sides should well implement the important consensus of the leaders, prepare for high-level exchanges between the two countries, plan the commemorative activities for the 70th anniversary of the establishment of diplomatic relations, explore the potential for practical cooperation in an in-depth manner, create highlights for people-to-people and cultural exchanges, and properly manage differences in the meantime so as to promote China-India relations for stable and long-term development. Wang Yi pointed out that the Chinese side opposes all forms of terrorism. We are concerned about the current tension in South Asia. As a mutual friend of India and Pakistan, the Chinese side hopes both sides will exercise restraint and avoid escalation. It is expected that the two sides will find out the truth of the incident through dialogue and jointly safeguard regional peace. Sushma Swaraj said that Prime Minister Narendra Modi and President Xi Jinping held an informal meeting in Wuhan last year, which promoted bilateral relations to realize rapid development. The two sides should work together to well implement the important consensus reached by leaders of the two countries, strengthen strategic communication, deepen practical operation, enhance people-to-people and cultural exchanges, well plan the commemorative activities for the 70th anniversary of the establishment of diplomatic relations between the two countries next year, and jointly safeguard peace and tranquility in the border areas in a bid to promote the stable and forward-looking development of India-China relations. The Indian side advocates that the international community should unite and coordinate with each other to jointly fight against terrorism, and the Indian side will deal with relevant issues in a responsible and restraint attitude.